As the retro-doomy-stoner-proto-metal revival approaches suffocating density, more and more practitioners are infusing that uncluttered style with heroic technical complexities. 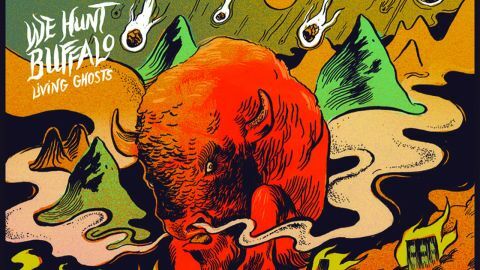 On their second full-length, We Hunt Buffalo follow a simpler blueprint, forging volleys of ginormous power riffs with kaleidoscopic fretwork, casting each of the nine tracks in a cinematic scale. While their debut suffered from porous song structures and scuffled mixing, Living Ghosts showcases a sharply expanded compositional outlook and taut, muscular production. The opening trio of Ragnarök, Back To The River and Prairie Oyster initiate the saga with battering riffage, cyclopean basslines and bone-powdering tempos. The latter half expands into a psych-metal epic, with mid-tempo fare like Fear and Walk Again sending long, bluesy leads soaring above gauzey shoegaze textures. Expertly balancing concussive heaviness with trippy interludes, Living Ghosts is a satisfying post-metal voyage.